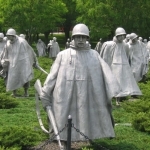 Korean War Memorial, Washington, D.C. via Wikipedia. PENDLETON, Oregon – Officially, the Korean War never ended. However today (July 27) marks the 65th anniversary of the cease-fire armistice that signaled a stop to the fight. While the war was never officially declared and never resulted in a peace treaty, it resulted in 33,686 American deaths in battle and 2,830 deaths that did not occur during battle. The Veterans Administration estimates that 1,789,000 U.S. troops served in theater. Umatilla County holds an annual Veterans Day gathering at the Pendleton Convention Center. This year, Board of Commissioners Chairman George Murdock says they want to have a special ceremony for Korean War veterans living in the county. Murdock says it’s important that the county have the names of the Korean War veterans, because of a special recognition that’s planned for the event on Nov. 11. “We will have commendations from the U.S. Senate to provide each Korean War Vet at that ceremony, so they’ll be individually recognized,” he said. Murdock urges veterans or their friends and family to notify the county, so the commendations can be made, and invitations can be sent to them. If you are a Korean War veteran, or know one, you should call Melinda Slatt at 541-278-6204.